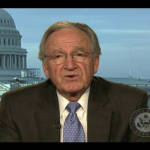 Senator Tom Harkin explains why the U.S. functions in a sick care model, and why we must develop a true healthcare system. To examine how Chiropractic and preventive health care fit within the Affordable Care Act. Tom Harkin served as a United States Senator from Iowa from 1985 to 2015. He graduated from Iowa State University and The Catholic University of America’s Columbus School of Law. He also served in the U.S. Navy as an active-duty jet pilot. Harkin won a race for U.S. Senate in 1984 and was an early frontrunner for his party’s presidential nomination in 1992 before dropping out in support of eventual winner Bill Clinton. At the end of his time in the senate, he served as chairman of the Senate Committee on Health, Education, Labor and Pensions.